Today’s starts a new series in the Book, Song of Songs. Throughout history, many have interpreted this scripture literally to be a love affair between a man and wife. It’s a nice sentiment. However, there’s a deeper message within its words. I’ll do my best to break it down and share its message. Feel free to comment your thoughts and ideas to add to mine. So, v.1-6, in the image above. What does it mean? The message is an allegory. Which means this, a story, poem, or picture that can be interpreted to reveal a hidden meaning; a metaphor, or symbol of something. What metaphor is this message giving us? It’s a message; a word picture, of Christ’s love for His church; the body. The kisses of his mouth mean the confidence of forgiveness among believers are honored, filling them with peace and joy in believing, and causing them to overflow in hope by the power of the Holy Spirit. Loving people take most joy in loving Christ and being loved by him. The name of Christ isn’t presently like ointment sealed up, but like ointment poured out; which indicates the liberty and fullness of going forward in His grace by the gospel. Those that he has delivered and blessed, here are the virgins that love Christ, and follow Him wherever He goes, (Revelation 14:4). The more clearly we recognize Christ’s glory, the more reasonable will we be that we are unable to follow him well, and at the same time be more enthusiastic about doing it. Observe the quick answer given to this prayer. Those who wait at Wisdom’s gate will be led into truth and comfort. And being brought into this chamber, our griefs will vanish. We have no joy but in Christ, and for this we are bound to him. We will remember to give thanks for your love; it will make more permanent impressions in us than anything in this world. Neither is any love acceptable to Christ but love in honesty, (Ephesians 6:24). The daughters of Jerusalem may mean teachers not yet verified in the faith. 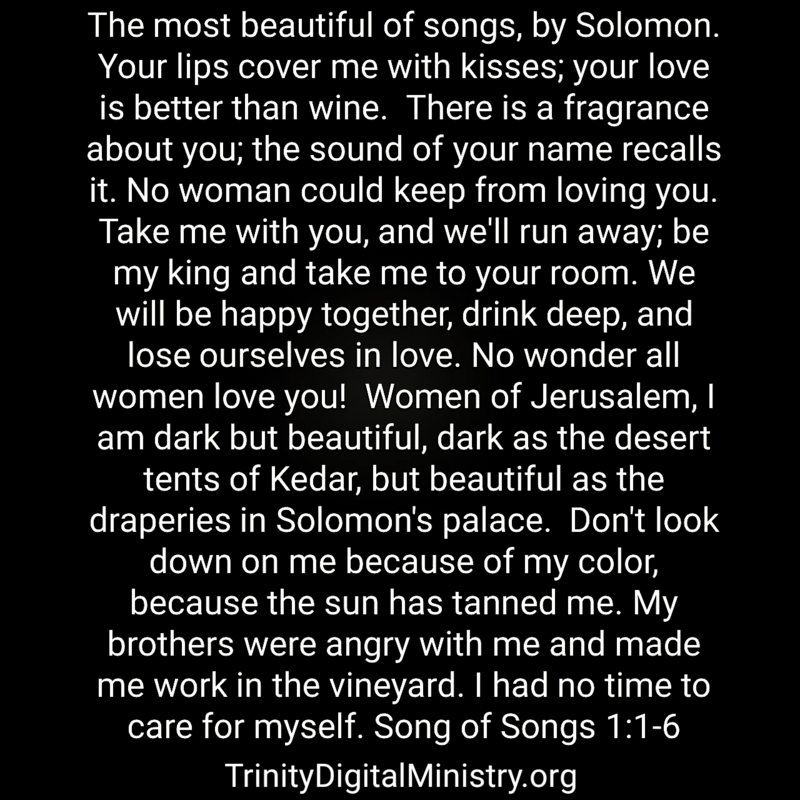 The wife was black as the tents of the wandering Arabs but beautiful as the magnificent curtains in the mansions of Solomon. The believer is black, as being polluted and sinful by nature, but attractive, as renewed by Divine grace to the holy image of Yahweh. The believer is still damaged with remnants of sin, but attractive as accepted in Christ. The believer is frequently vulgar and wicked in the respect of people, but great in the sight of Yahweh. The blackness was due to the harsh practice that had been endured. The people of the church, but not of Yahweh, were mad with her. They had made her endure difficulties, which caused her to overlook the care of her soul. Therefore, under the image of a weak female, made the preferred wife of a prince, we are directed to observe the events in which the love of Christ is typical to finding its recipients. They were wretched slaves of sin, at work, or in grief, overworked and heavy burdened, but how great the change when the love of Christ is shown to their souls! Christ’s love is so absolutely mind blowing awesome! It’s so amazing how this story is a symbol of Christ’s love for His children. Where do you stand in this story of love? Comment your story, briefly, and bless others as you’re blessed in the telling. This is part 1 of the series: Christ’s love through Song of Songs.